Protect Your Kids from the Sun! Assemble an Affordable Sun Care Kit! 1. Buy an affordable tote. I'm not a fan of sun care products spilling in the bottom of my purse. If I put them in the "pool bag" they are never where I can find them. Having a dedicated "skin care" tote is the best answer for our family. I picked up this bag (shown above) for just $0.88 in the summer tote section of my Walmart. It's light, like a shopping bag, but very cute! 2. Buy generic. I always try to get the Equate brand products when available. To me, they've always been as effective, and Walmart offers an Equate version of most every product we use during the summer. I opt for a baby sunscreen lotion, a kids sunscreen lotion (for face and ears), and a kids sunscreen continuous spray (for the body). We also stock up on some aloe sunscreen relief -- just in case. I hate to think we would allow a burn, but even a little "pink" can make kids uncomfortable. Just be certain that you check the ingredients. Some of the aloe products contain lidocaine, and some kids are sensitive to this ingredient. 3. Consider hats. We are big fans of hats during the garden season. There really is no better way to protect a scalp (which is hard to apply sunscreen to), and it stays on long after the sunscreen wears off. By starting kids young and getting them used to wearing hats, you can develop a habit that can save their life down the road! As an assistant in a dermatology clinic years ago, I saw horrible consequences of those in the farming community who refused to wear hats. I don't even want my kids to go through painful surgeries or cancer diagnostics because we were negligent. This little Spongebob hat (above) is under $7, and kids will find it fun to wear! Remember, if you wear one -- and lead by example -- kids will be more likely to embrace the hat! None of these tools will work if you don't remember to use them. Be sure to leave your suncare kit by the door where you will be certain to be reminded of it. Try not to keep sun care items in the car for very long -- they can get hot and ruin the products. What tricks do you have for keeping kids' skin safe in the sun? 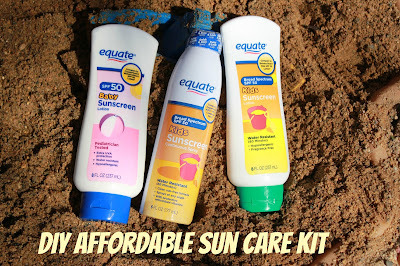 Is there something in your sun care kit that you recommend?